Guinea Pigs need fresh fodder. 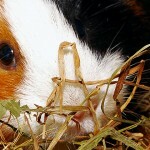 There are two different kinds of fresh fodder you can feed your cavies with. We tell you the details about. [Auto translated] Fresh fodder is separated in two different kinds which have to be provided in different kind: fresh fodder like herbage and water based fresh fodder like vegetables. Let’s have a look at the difference. Fresh fodder is everything you provide undried and raw. Herbage like dandelion, sorrel, ribwort and something similar is classical fresh fodder. 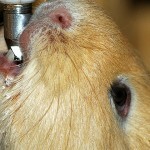 It contains all nutrient the cavies need and it can be provided in huge amounts. For each season you’ll have to provide it in short amounts first and raise it step by step. Ensure that any fresh fodder isn’t moisture if you feed it to prevent faulty fermentation. Wet fresh fodder can cause colic’s, flatulence and diarrhea. Do never pick fresh fodder directly from roadsides or at borders from lately manured fields. Lawn cuttings must not be provided! This blades of grass are smallish and its own fermentation process starts quickly. You can take notice of that by its temperature. Long grass which has been cutted with a scythe or fresh picked grass can be provided. If you can pick the fresh fodder steady directly from a glade with fresh herbage and wild flowers you can completely replace the water based fresh fodder seasonal. If not, you have to supplement with water based fresh fodder. 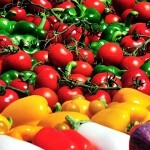 Water based fresh fodder is any kind of vegetables and fruits. Have a look at our food-list what’s to be provided. Vegetables and fruits can be essential during the winter season to help your Guinea Pigs to get all vitamins they needed. You should provide water based fresh fodder two or three times a day. Leftover fodder has to be removed before you start the next feeding. Fruits should be provided rarely due to its fructose. 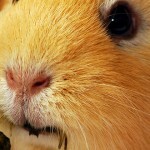 Guinea Pigs needs a amount of at least 10% of their weight of fresh fodder every day to cover their demand in vitamins.